﻿ S.C. bats begin to emerge from hibernation, and need your help! April 7, 2016S.C. bats begin to emerge from hibernation, and need your help! March and April mark the end of hibernation for many of South Carolina's bats, which began between three to seven months ago, depending on the species. Seven of South Carolina's 14 bat species are commonly known to hibernate in mines, caves, or tunnels in the state, according to Jennifer Kindel, wildlife biologist with the S.C. Department of Natural Resources (DNR). 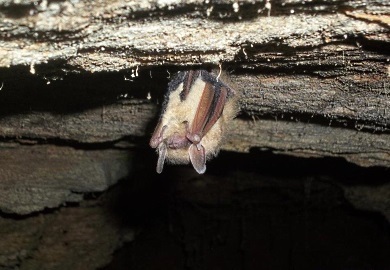 The hibernating South Carolina bat species include the big brown bat, Eastern small-footed bat, little brown bat, Northern Long-eared bat (a federally threatened species), Rafinesque's big-eared bat, Southeastern bat and tricolored bat. Other species in the state hibernate in trees, such as the Eastern red bat, Northern yellow bat, Seminole bat, and silver-haired bat. Some species even use both trees and underground structures, as in the case of the Southeastern bat. But did you know none of these species stay asleep (known as torpor) the entire time? Kindel said bats may wake from hibernation to seek suitable temperatures, avoid disturbance, enhance immune function, obtain water, mate, or even forage outside the hibernacula (the winter den of a hibernating animal). For example, Rafinesque's big-eared bats in South Carolina are known to forage on warm nights when insects are available, using intermittent, shallow hibernation only on particularly cold nights. Yet tricolored bats are obligate hibernators, meaning that even when food is available in warmer weather they rarely leave the hibernaculum, and tend to stay in deep torpor for the longest periods - the longest recorded at 11 days at a time. In South Carolina's Upstate, tricolored bats spend the longest time hibernating, from around October through March or early April. Site fidelity to hibernating sites for this species is relatively high, meaning they often return to the same site year after year. 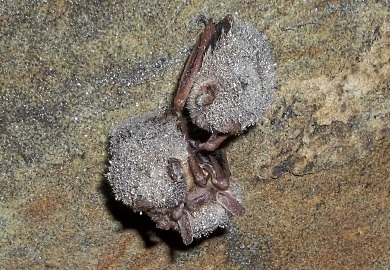 Hibernating bat species have been hit hard by the devastating disease called white-nose syndrome. Bats hibernate where the fungus that causes the disease thrives, often where temperatures are stable, humidity is high, and airflow is minimal. Because the spores of the fungus are easily transported by humans (but do not affect humans), all caves and mines on National Forest lands continue to be closed until 2019. Please help prevent bat deaths by respecting these closures and spreading the word about white-nose syndrome instead of spreading the fungus!